Playa Del Carmen, Mexico, is a wonderful location in which to learn Spanish. Our school in Playa Del Carmen offers high quality Spanish courses with on-site residence and pool. Studying Spanish at our school, just a short walk from the beach, students can also learn to scuba-dive, to Salsa dance and go on a wide range of fascinating excursions. 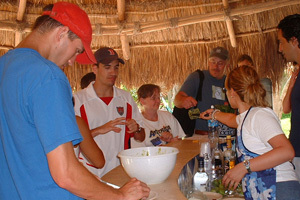 Few locations in Latin America offer Spanish language programs so close to the beach and in such a beautiful setting. The magnificent sandy beach at Playa Del Carmen is fringed by palm trees and lapped by the warm turquoise waters of the Caribbean Sea. Here the locals are friendly, visitors are welcomed, and great care is taken to protect the beaches, reefs and forests from development. All new buildings within sight of the beach are built in the traditional local styles and are sheltered by the palm trees, which line the beach. This is a paradise for beach lovers, snorkellers, divers and for those who wish to combine a high-quality Spanish course with a beautiful Caribbean location. Our school in Playa Del Carmen, located at just 7 minutes walk from the beach, is a purpose built Spanish language school, with 7 classrooms, a library, dance studio, cafeteria, small private pool and on-site 20 room student residence. The thatched roof, stone walls and tiled floors blend in with the local architecture, providing students with a high-quality, air-conditioned language learning environment, whilst at the same time offering comfortable accommodation for those who choose to live in the on-site residence. The pool is an added bonus! Fly to Cancún airport. Public bus or airport collection service to Playa Del Carmen. Excursions to archaeological sites, ecological parks, scuba diving, sailing, snorkelling, windsurfing, horseback riding, turtle-watching.